New York, NY: HarperPrism, 1997; $6.99 paperback; 560 pp. This review originally appeared in the July 1998 issue (#119) of The New York Review of Science Fiction. That the major publishers, with their obsessive desire to pigeonhole everything into its proper marketable niche, or away from an undesired niche, have difficulty in categorizing gives me some joy. 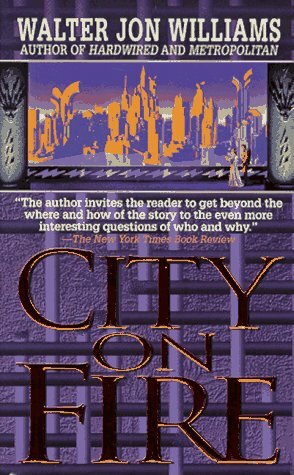 HarperPrism provided an excellent example of this when they marketed Walter Jon Williams’s Metropolitan as science fiction and its recent follow-up, City on Fire, as fantasy. Although Williams has said he’s writing fantasy, I can understand why HarperPrism had such a dilemma. After all, the novels feel like science fiction-they’re set in a futuristic, Trantor-like Earth ruled by city-states and enclosed by an alien-created shield that prevents anyone from leaving the planet. Furthermore, the world runs on an incredibly powerful substance known as “plasm.” But plasm has properties that make it seem more like magic than anything that can be rationalized. In the hands of “mages,” those specially trained to handle plasm, its uses include: creating advertisements in the sky; administering a wide variety of medical treatments, including anti-aging techniques; waging war; repairing severely damaged buildings without the use of any construction vehicles; creating a temporary body that makes telepresence possible; and even moving objects or people via teleportation. City on Fire picks up the moment where Metropolitan left off, told again from Aiah’s point of view. Constantine, a former rebel leader, is now in the process of implementing the new government of the citystate ofCaraqui, the government that would have never come to power without the help of Aiah. While a mid-level bureaucrat with the citystate ofJaspeer, she discovered a previously untapped plasm source and sold it to Constantine, giving him and his cohorts the power they needed to overthrow the corrupt Caraqui government. Still under threat of plasm theft charges, Aiah has now left her home, fiance, and job in Jaspeer to join Constantine. Caraqui is his attempt to realize the New City, his idealized dream of a proper city-state. Constantine welcomes her offer to further assist in making that dream possible. However, once Aiah settles into her new position, she quickly sees that the government is not running as smoothly as anyone would like: the former government and the criminal organization that helped prop it up are trying to regain power; neighboring city-states, upset about the ruined status quo, are assisting these elements in their power struggle; Caraqui’s plasm reserves are seriously depleted and its ability to defend itself compromised; the police force, a holdover from the previous regime, is less than reliable; and different arms of the new coalition government have competing agendas. It’s a realistic picture of almost any post-revolution country. Whereas the focus on the affair between Aiah and Constantine made Metropolitan more of a romance novel, City on Fire is a novel about taking and controlling power, with the romance between Aiah and Constantine almost something pursued fitfully in whatever quick bursts they can grab. The varied power struggles affect just about every aspect of the character’s lives; struggles exist between governments (both deposed and empowered) and individuals, friends and colleagues, supposed equals, the righteous and their opponents, and even between Aiah and Constantine. And of course, one of the most important struggles is with finding ways to obtain more plasm. While power plays exist on many levels in the novel, our attention centers on those made by Aiah. Despite all her talk about being one of “the cunning people” (her ethnic group’s self-styled description), in Metropolitan she seemed capable only of reacting to the events around her, taking control of the situation only when forced into it and when no other option was available. These power plays are part of what make City on Fire a marvelous novel that is stronger than its Nebula-nominated predecessor. In a style just as smooth and readable as the one he used in Metropolitan, Williams places Aiah and Constantine in a much more complex situation where the solutions are harder to come by and the consequences are much more dangerous. This situation also adds layers of complexity to the personal relationship that these two share. One of the most satisfying things that makes City on Fire a better novel than it’s predecessor is Aiah’s character growth. The events of Metropolitan have changed her; she wants to make sure that she is actually responsible for whatever she is blamed for. Although she obviously still has plenty to learn–she’s somewhat impatient and occasionally acts just because she doesn’t want to sit around and do nothing–it’s a remarkable change that takes place; by the end of the novel, Aiah becomes a force to be reckoned with–one who has an agenda all her own and has the resources to enforce it. Willing to make a power grab when she feels the necessity, Aiah actually confronts Constantine on issues of importance to her-something that never happened in Metropolitan-and even acts on her own accord without his support. In contrast to Aiah and the way she learns to handle power, Constantine is a portrait in conservatism. Because of his past failure in trying to bring about his dream of the New City, Constantine acts cautiously, fearful of repeating his previous mistakes and moving only when all the proper preparations are in place. His actions are those of an elder statesman, an expert who is accustomed to the Machiavellian subtleties that enormous amounts of power sometimes make necessary. Unfortunately, events occasionally force him to act either when he feels he is not fully prepared or with a heavier hand than he wishes to use. In private moments alone with Aiah, Constantine’s carefully guarded composure drops, and we get a glimpse of some the strain that years of bloodshed have caused. These rare moments, ones unlike anything seen in Metropolitan, make Constantine a much more realistic, fully developed character. Buried somewhere deep beneath this hardened, highly polished, and decisive persona is a man who questions his belief that the New City will ever occur, who detests some of the methods he has used, and who wonders if too much blood has been spilled. Without these glimpses, Constantine would be just another two-dimensional revolutionary with a dream of how he would run the world. But as much as these glimpses round out our view of him, they do not give a favorable impression of Constantine. Throughout the novel we are reminded that he will sacrifice friends and loved ones to see his vision become reality and that he will use draconian means if necessary. Furthermore, towards the end of the novel, some of what we have been led to believe about his character is called into question, thus implying a truly sinister side. Aiah and Constantine are set in a world that provides plenty of opportunities to spotlight the differences in how they deal with their respective power. War-torn from the revolution that brought Constantine and his cohorts into control, Caraqui provides a much more interesting setting than Jaspeer did. Unlike the majority of cities that literally cover this planet, Caraqui is located on water, which means that all the buildings float on huge pontoons interconnected with chains and bridges. During the course of her work, Aiah often finds herself within the Venice-like waterways between the buildings as well as underneath the bottoms of the structures supported by these pontoons, a setting unique to this part of Williams’s fictional world. Constantine, on the other hand, rarely ventures down there and conducts most of his affairs from the palace that seats the government. An important element of Caraqui is found in the underbelly of this unusual city. Surrounding the pontoons and out of sight of most of the population is the underclass of “altereds,” a group of people genetically changed in order to perform menial labor that normal people cannot, that a large percentage of the population would rather ignore. It quickly becomes clear that the altereds simultaneously represent both the homeless of our industrialized world and the residents of our third world. The course of events makes them a sympathetic people; when the police force starts breaking up bands of altereds as a public relations move, Constantine stops them in a council meeting. Later, Nazi-like persecution of the altereds by one arm of the government and Constantine’s apparent inaction force Aiah into a decision about taking direct action and aiding them to the best of her abilities. Factoring heavily into the decision is the working relationship she has with the second-in-command of her department, an altered with whom she is initially loath to work but with whom she eventually becomes friends. Aiah’s decision and resultant actions show just how much her character has grown. Another interesting group residing in Caraqui is the Dreaming Sisters, a powerful, quasi-religious cult that broadcasts messages into the city’s skies. When Aiah visits their temple to investigate possible plasm theft, we learn some of the fundamentals of their beliefs. During her visits, Aiah discovers that, in addition to understanding plasm better than most mages, the Dreaming Sisters might have prophetic abilities. These prophecies are physically represented in imagoes, relief images that line the interior walls of their building, and the symbolism of some of these imagoes suggests how the events of the novel will unfold. However, since we see the events of the novel through Aiah’s eyes, some doubt exists as to just how much Aiah is projecting her situation onto what she is seeing and how much is really what they represent. This doubt increases as we reach the end of the novel. The fact that the Sisters control a vast amount of otherwise untapped power only adds to the mystery surrounding the imagoes. Despite the strong characters, interesting setting, and unusual groups within the setting, City on Fire is not a perfect novel–it suffers from many ailments that affect books in the middle of a series. (In an interview with Nova Express, Williams said, “Lord help me, I am writing a fat fantasy trilogy.”) Despite Williams’s best efforts, starting City on Fire is like taking your seat just before the start of the second game of a playoff series: even though we’re starting anew, the events of the previous game remain relevant to this one. Additionally, even though Williams does an admirable job of filling in backstory relatively unobtrusively, a few snippets of it leap out jarringly at you. Reading Metropolitan isn’t necessary to enjoy City on Fire, but it certainly helps. More importantly, City on Fire closes with many of the main plot lines dangling. The full ramifications of a couple of key events, including an incident involving Aiah and the shield, are going to require serious exploration. It’s like leaving the playoff game at the end of regulation while it’s tied. This is possibly the only area where Metropolitan was a stronger novel; even though its ending wasn’t entirely satisfying, it provided a fairly strong sense of closure, a sense City completely lacks. However, these minor problems don’t change the fact that City on Fire is an outstanding novel. Watching Aiah’s character growth alone makes this novel a satisfying read, but by throwing in intricate power games, a new setting within an established world, a religious group with great untapped powers, and a few other surprises I don’t want to ruin, Williams has created an ambitious novel that achieves everything he aims to accomplish. It’s a novel that should appeal to almost any sf fan, regardless of whether her/his taste runs towards fantasy or towards science fiction. This entry was posted in Book Review, Walter Jon Williams. Bookmark the permalink.